I’ve always been fascinated by the story behind the 1988 movie “Stand Deliver” starring Edward James Olmos. 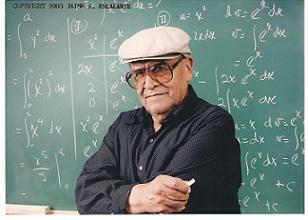 The film is a true story based on the life of Jaime Escalante, a math teacher who transformed a tough East Los Angeles school by motivating struggling students to excel at advanced math and science. The school, Garfield High School, had more advanced placement calculus students than all but three other public high schools in the country. Sadly, Escalante died Tuesday, March 30, 2010 in Reno, Nev. where he was undergoing treatment for bladder cancer. He was 79. An immigrant from Bolivia, Escalante exposed an unfounded myth that inner city students can’t be expected to perform at the highest levels. At first he was discouraged by Garfield’s culture of low expectations, gang activity and administrative apathy. Gradually, he overhauled the school’s math curriculum, requiring all students to take algebra while enabling those who were previously considered unteachable to master math and pass the advanced placement calculus test. He believed in his students and built their confidence. I’ve been meaning to watch the movie for years, and I finally bought a copy at Fry’s recently when I stopped in to buy a 2-terabyte external hard drive (can you imagine that much storage for only $139!). I know this movie will become one my favorites. I plan to watch it whenever I need to feel motivated.